A couple of crime titles today, one a vintage crime story, the other modern day. 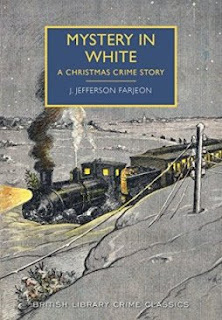 First up, the vintage one, Mystery in White by J. Jefferson Farjeon. A group of people travelling by train get stranded when the train is brought to a halt by snow drifts. They get talking and it turns out that one of them, a man called Maltby, is an expert on psychic phenomena: his conversation makes the others rather uneasy. Suddenly, Maltby takes off, having seen something moving outside. Eventually the others follow realising it's a choice between walking and possibly being stranded in the train for days. They all pitch up at house which is oddly abandoned. 'Oddly' because it seems the owners lit the fire, laid the table for a meal and then left. It's spooky to say the least. With two of their number injured they realise they will have to spend the night as uninvited guests. But where exactly are the owners and who is the ruffian who turns up out of the blue and what is he looking for in the house? One thing's for sure... it's going to be a very long night. This is one of those gorgeous new editions of British Library Classics, reissues of crime stories originally published in the 1920s, 30s and 40s, all with lovely covers. They're proving to be very popular and it's easy to see why as they recall a sort of golden age of crime writing and are very reminiscent of the writings of Agatha Christie and so on. Often they're books whose authors have been largely forgotten... I'd never heard of the wonderfully named J. Jefferson Farjeon for instance, despite him having written, apparently, over 80 novels. (He was also descended from Thomas Jefferson, just as a matter of interest.) Anyway, this was an enjoyable yarn with a spooky bent... not enough to be frightening, but enough to give it a frission of excitement. 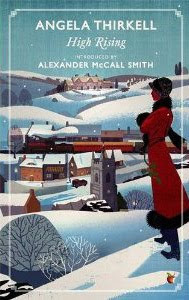 For those who like a book with a snowy setting this is perfect... it's snowy all the way through and there is *lots* of it! I wouldn't say that the characters jumped off the page at me but the mystery element and the setting make up for that. The cover declares it to be 'A Christmas Mystery'. If that's what you're looking for this is not really it. It's definitely snowy, but is not all that Christmassy, not in my opinion anyway. A good solid vintage crime yarn that made a fun and enjoyable, winter's read. Mystery in White is my book 4 for Bev's Mount TBR 2016. 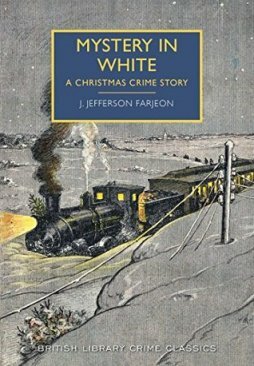 It also qualifies for her Vintage Mystery Cover Scavanger Hunt as 'Book with a Christmas Tree on the cover' (it's on the front of the train). 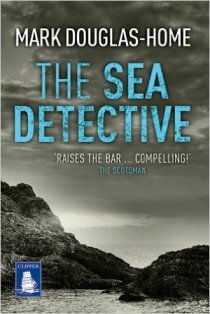 Next, The Sea Detective by Mark Douglas-Home. Cal McGill is an expert on tidal forces in the seas and oceans of the world, especially those around the North Atlantic that affect his home country of Scotland. His ancestors were from a now uninhabited island off the west coast of Scotland, his grandfather having died along with six other men during the second world war. Their trawler was on war business in the seas around Norway at the time but mystery surrounds his grandfather's death and his name is not on the war memorial to their heroism. I'm not sure that that's a very good description of what is quite a complicated book. Lot going on this one, three plotlines to follow, but I have to say I didn't find it difficult at all. One of the storylines, that of Basanti and Preeti, is quite disturbing in a sexual abuse manner so if that's not your bag, avoid this one. Cal McGill is a very different sort of hero, not really heroic at all just an ordinary bloke who is very bright and obsessed with oceans and tides. It was all rather fascinating to be honest. Helen Jamiesson I liked very much too, representing the ordinary woman who is clever and outlining the way they can be treated by shallow people who think that looks are everything. Unusual for a male author to understand that perspective I would have thought and Mark Douglas-Home clearly does. Helen's boss, DI Ryan, is appallingly chauvanistic and a fun aspect of reading this book is cheering Helen on as she copes with this. The other plotline, the historical one of the wartime island heroes, was also extremely well done and fascinating to follow. Lots of secrets and nastiness in how Cal was treated by descendents of the men who died along with his grandfather. Good sense of isolated communities on Scottish islands back in the 1930s and 40s. I gave this book five stars out out five on Goodreads. That's how much I liked it. You can always tell what effect a book is having by how much you want to keep picking it up to read on, and I found it hard to put down, which I had to a lot this week as I've been busy. There are two more books and I'll be getting book two, The Woman who Walked into the Sea, from the library as soon as I can. Two brief (well, I'll try...) reviews to catch up on today, a fiction and a non-fiction. 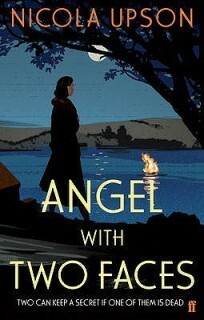 First up, Angel With Two Faces by Nicola Upson which is my book two for Bev's Mount TBR 2016 challenge. Josephine Tey needs to get some work done on her second Alan Grant Novel (it will eventually become A Shilling for Candles) so she accepts her policeman friend, Archie Penrose's, invitation to holiday in Cornwall at the home of his family. Archie comes from the area around Loe Pool near the village of Porthlevan, his uncle being the owner of a local private estate. He ends up having to go ahead of Josephine to attend a funeral. A young man, Harry Pinching, has drowned in the pool, a riding accident by all accounts. But was it? The man's sister, Morwenna, hints to Archie that she suspects her brother may have committed suicide. But why would a fun loving young man with a real zest for life do such a thing? As soon as Josephine arrives she becomes embroiled in the mystery. She's horrified to discover how many secrets are being harboured in such a small community. Very soon she doesn't know what she can say to whom and realises this could threaten her relationship with Archie. One thing is for certain, answers lie in the past... and it's about to catch up with them all. Slightly torn by this one. On the one hand, I loved the setting: I've walked at Loe Pool (it's a lake separated from the sea by a sandbar) and it's just as beautiful as the author describes, so that was very evocative for me. Josephine was there for the bluebells and I too have been there at that time of year and it's stunning. It's quite clear the author, Nicola Upson, knows that area rather well. (But then she is a 'local' author as she attended a crime panel I went to at my town's literary festival last summer... which is where I bought this book.) So that aspect of the book I liked. What I found a wee bit tiresome was the fact that every single person in the book had a secret and, like poor Josephine, I got rather confused and lost in the detail. It all felt a bit melodramatic to be honest, a bit overdone. 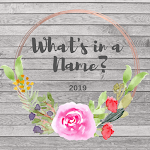 Some of the characters were a bit clichéd such as Morveth, a teacher who is also a bit of a healing woman and slightly batty (or so it seemed to me), and Morvenna's sister, Loveday who's a bit fey, and the evil vicar who's Up To No Good. It was a good enough story to keep me reading to the end though, a decent mystery, and I do like Josephine and Archie. But I don't own any more of the books and if I do decide to read more I'll probably get them from the library. Lastly, Greece on my Wheels a non-fiction travelogue by Edward Enfield. This is my book three for Bev's Mount TBR 2016 challenge and my book one for Rose City Reader's 2016 European Reading Challenge. Edward Enfield is the father of the well-known British comedian, Harry Enfield. He was pretty much unknown when he appeared on the BBC's consumer programme, Watchdog, representing the older person's point of view. He then wrote for the magazine, The Oldie, for many years. He's written several books about cycling in various parts of Europe and in Greece on my Wheels he does two journies, one around the Peloponnese and the other, Epiris and Acarnania... both in Greece of course. The style here was chatty and informative. You really get a taste of the Greek countryside, how mountainous it is, how beautiful, and also the heat. The author was 71 when he undertook this trip and you have to admire his stamina! He clearly enjoyed the food and the wine, and he often advises about where to stay and where to eat if you too are holidaying in these areas. Very useful. Edward Enfield wanted to do the journey as he's very keen on Greek literature and history and there's quite a bit of that included in the book, especially various conflicts between Greece, Albania and Turkey. Other countries - including Britain - also had their fingers in the pie too and not always in a good way, in fact, mostly not. He also followed in the footsteps of other travellers and he often includes excerpts from travelogues by Lord Byron, Edward Lear, Benjamin Disraeli and John Hobhouse. These I really enjoyed and would love to search out the original books and read those, particularly Byron's. I knew he was a bit of a hero in Greece for his role in their war of independence with the Ottoman Empire, but not quite how much... he did in fact die during the conflict. All very interesting and I feel as though I learnt quite a bit from reading this travelogue about Greece. I shall search out more by Edward Enfield - I think there's a book about cycling around Ireland and one where he follows the route of the Danube - as he manages to be both informative and entertaining in his writing. I haven't actually added the Waterstones ones, will check them out properly soon and possibly add them. And there must be more for each category. 'Loads' more. So if anyone can think of any, do please leave a comment. It's a bit disconcerting when the first fiction book you read at the beginning of a new year is stunningly good. You almost feel a bit twitchy about it... as though you have no right to come upon a terrific book in the first week of January. And there's also that uneasy feeling that it might be downhill all the way from here. Hence the twitchiness. 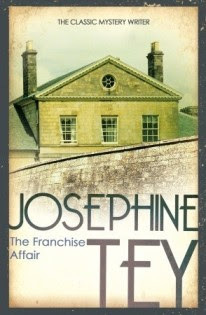 Anyway, regardless of me and my peculiarities, the excellent first book is The Franchise Affair by Josephine Tey. Middle-aged solicitor, Robert Blair, is about to leave his office to go home, late one afternoon when the phone rings. Five minutes later and he would've missed it and his very routine, his cozy life, would not have been changed forever by that call. On the line is Marion Sharpe. Miss Sharpe lives with her elderly mother in large house, The Franchise, on the edge of the sleepy town of Milford. The two are quite reclusive so are not well known in the town: Robert barely knows the woman. Miss Sharpe tells Robert that the police are in her house accusing her and her mother of kidnapping a teenage girl, Betty Kane, locking her up in the attic for several weeks and trying to coerce her to work for them as a maid come cleaner. They deny all knowledge of this. Robert tries to convince Marion to phone a solicitor more experienced in criminal law, in all honesty he doesn't really want to touch the case. She refuses and he heads off to The Franchise. "At 3.50 exactly on every working day Miss Tuff bore into his office a lacquer tray covered with a fair white cloth and bearing a cup of tea in blue-patterned china, and, on a plate to match, two biscuits; petit-beurre Mondays, Wednesdays and Fridays, digestive Tuesdays, Thursdays and Saturdays." "Have you had a nice day dear?" Aunt Lin asked, opening her table napkin and arranging it across her plump lap. This was a sentence that made sense but had no meaning. It was as much an overture to dinner as the spreading of her napkin, and the exploratory movement of her right foot as she located the footstool which compensated for her short legs. She expected no answer; or rather, being unaware that she had asked the question, she did not listen to his answer. In a few short sentences you know everything you need to know about Aunt Lin. Josephine Tey was so honest in describing feather-brained women like this that it's almost cruel. If the author was a man you might actually say so, unfairly I think because people like this do exist and pretending they don't is dishonest. One of the crucial things to know about this book is that although it's listed as book 3 in the Alan Grant series, it really isn't. Inspector Grant makes three or four appearances where he's not even a particularly sympathetic character... he's the one charged with investigating Betty Kane's claims but he really doesn't seem that fussed about discovering the truth. This book is about the solicitor, Robert Blair. And the odd thing is... I didn't mind at all. I'd go so far as to say that of the three Alan Grant books I've read so far, this is by far the strongest. And I'm a bit perplexed by this, him not actually being in the book very much. I'm wondering if it's because the first two were rather theatre/stagey and that isn't particularly my thing. Whereas a story about a small town solicitor dragged out of his comfort zone into the real world to investigate a nasty little case where everyone turns against the accused, was, for me, utterly rivetting. Plus, as I said before, so beautifully written. Sly observations of people's behaviour, Miss Marpleish in their pin-point accuracy, just make this book come alive and you end up chuckling to yourself, even when sometimes you probably shouldn't. Interesting to observe too that although this is a 1940s book, their problems with tabloid newspapers and mobs outside the houses of people accused of crimes was exactly the same as ours in the 21st. century. Nothing changes it seems. Indeed, this didn't really feel like a 1940s book at all apart from one or two attitudes of the time. The whole nature of the story felt like it could have happened last week, not 70 years ago. It's quite an achievement to write such a timeless story. I can't wait to read more by Josephine Tey and am inclined to try her two standalones next, Miss Pym Disposes and Brat Farrar. The Franchise Affair was my first book for Bev's Mount TBR 2016 challenge and also my first book for her Vintage Mystery Cover Scavenger Hunt challenge. I'm using it for the category of 'Spooky house or mansion'. I realise it doesn't look madly spooky but as it's described in the story as 'that dark silent house set down among endless fields', I think it pretty much qualifies. Well, that was a year that flew past. I know they say that time speeds up as you get older but that was ridiculous. I have a feeling this coming year will do exactly the same... which is a scary thought really. Never mind. So, 2015 as a reading year. Altogether, 60 books were read by me. That's 40 down on last year which I quite expected, nay, 'encouraged' to be honest. I was pleased to have got to 100 in 2014, first time ever, but had no intention of trying to do it again in 2015. 60 is a perfect number for me. 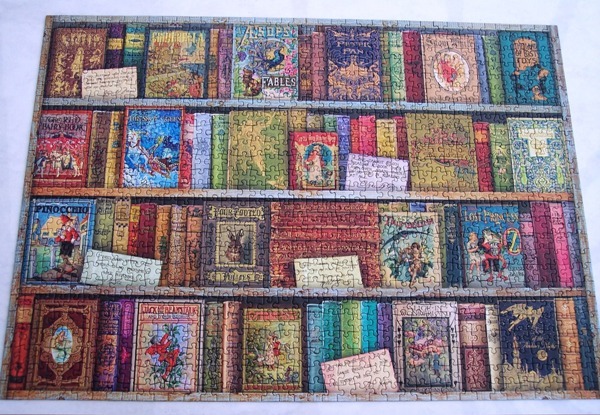 It allowed me to do other things, such as spend much of the summer and autumn doing loads of lovely jigsaw puzzles. And what fun that was! Looking at my 2015 shelf on Goodreads it seems the 60 books were very mixed indeed. 14 were non-fiction... that's a figure that could be *much* improved upon and I hope to do that in 2016. 23 were crime reads of one description or another, which goes to prove that murder mysteries have become my staple diet as regards reading. I kind of knew that but am actually quite surprised at the number... that's a 'third' of what I read. Other genres are represented... fantasy, science fiction, horror... but not as they have been in previous years. Interesting. I usually pick 5 favourite books from both fiction and non-fiction so I'll stay with that as it works for me. Strangely these are not necessarily the books that got 5 stars on Goodreads (although most of them did) they're books that have stayed with me through the year for one reason or another. 1. Fire Upon the Deep by Vernor Vinge. Top-notch science fiction story. 2. The Tenderness of Wolves by Stef Penney. 1860s Canada, a murder mystery, and travelling in the wilderness. What's not to like? 3. Arms of Nemesis by Steven Saylor. Brilliant crime yarn set in Ancient Rome. Loved the coastal, 'travelling' feel to this book. And it was nicely weird too. 4. The Violins of Saint Jacques by Patrick Leigh Fermor. Short little book about an island in the Caribbean and its inhabitants. The end justifies it being among my favourites from last year. 5.August Folly by Angela Thirkell. 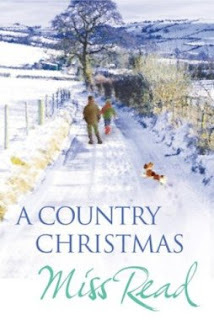 Gorgeous little 'family and friends in a village and what they got up to one summer' sort of story. Adored it. Helliconia Winter by Brian W. Aldiss. Winter on another planet. Best instalment of this trilogy. Gaudy Night by Dorothy L. Sayers. Lord Peter Wimsey and Harriet Vane. 'Nuff said. 1. Mountains of the Mind by Robert MaCFarlane. Terrific book that's primarily about mountains but includes a lot, lot more. 2. Clear waters Rising by Nicholas Crane. The author's amazing ramble across Europe's mountains. 3. Agatha Christie: An Autobiography. Simply one of the best autobiographies I've ever read. Whether you like her books or not this should be a 'must read'. Wonderful. 4. The Churchill Factor by Boris Johnson. An excellent book about this unique WW2 leader. 5. Wildwood: A Journey Through Trees by Roger Deakin. Trees, trees, trees, both in the UK and overseas. To be honest there were very few books from 2015 that I didn't enjoy to a greater or lesser extent. These days if I'm not enjoying a book I tend to give up on it. As you get older you realise your time left to read is getting shorter and shorter and spending it reading book you're not liking is a waste of your precious time. I can't praise Agatha Christie's autobiography highly enough. It was simply fascinating - like sitting down with a cup of tea and having a really long chat with her. I would recommend it to anyone whether you enjoy her books or not. Happy New Year and I hope 2016 is a good reading year for you.